If I was going to measure my time on this planet, I would hope to be measured by the amount of love I left while I was here. Did I leave each thing more covered in love than I found it? Did I attempt to action in love? Did I make things better? Was I present in my interactions? Did I leave a lasting print of love on the people I meet? Did I love? The questions are simple. You know the answer when asked. 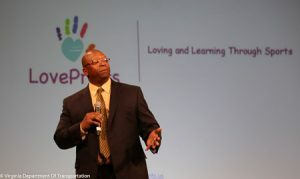 The speaking engagements that I have been honored to speak at have all been opportunities to love more, in word and in action, than ever before. These events put me in a circle of people who may or may not know me. It is my task to add smiles, add hugs, and ultimately, add love. It is my job to close the space in the room. I find that it is easier to do so if I am adding love to that space. It is a labor of love. It is amazing to get into a space and attempt to fill that space with more love, no matter who the people are.. It can be exhausting sharing the energy of any mass of people, but when the energy is love, it is the greatest form of energy. It is the best form of energy. It fills the room the most authentically. It also lasts longer. Love travels well. Speeches are love out loud. Each time I grab a microphone or take a stage, I feel like I have a responsibility to add happiness. To add love. Each event is an action in love. Each one is love in action. I may not reach everyone, but the ones that I do reach are left better than I found them. That is what love is for. These photos are from the Unity Day event at the Altria Theater in Richmond. I was invited to give the keynote speech to a room of a thousand people, and I must say that I received more smiles and hugs after the event than any other event I have ever spoken at (because I had access to the people afterwards). It is powerful to put love into the air and watch it take over a space and the people in it. I understand the chemical reaction that performers get in front of a crowd of people. It is a rush, and it changes you for the better. To have that chemical be love based is the highest level of happiness. A room filled with love and good is a vacuum of that same love. I look forward to the next room filled with love. There is no space that love cannot fill. I will be there, adding love. I hope to see you there! Thank you, Virginia Department of Transportation for allowing me to add love to your employee's day. They certainly added love to my day. Newer PostLovePrints. Why do we coach? Older PostLovePrints. 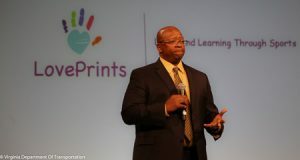 My LovePrints are for everyone.